The American Academy of Pediatric Dentistry recommends that your child's first visit to the dentist should occur by 12 months of age. The earlier we begin, the better chance we have, as a team, to prevent problems before they begin. 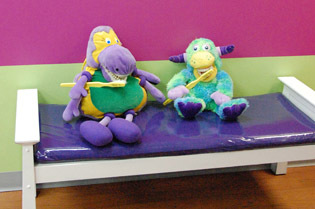 Tell your child that the dentist is a friendly doctor who will help your child stay healthy. Talk about the visit in a POSITIVE, matter-of-fact way, as you would about any important new experience. 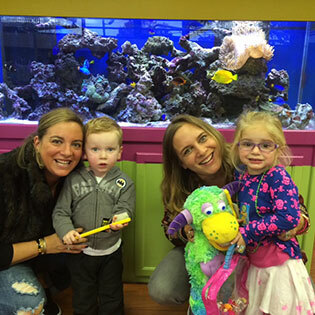 A visit to the office can be a very pleasant adventure for both you and your child. 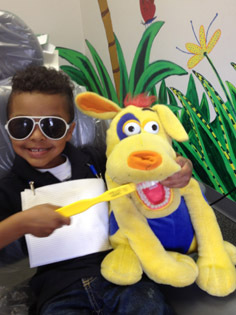 On the first visit, your child will be introduced to our dental team. Your child will be shown all the instruments the Doctor will use on the first visit, ie., the tooth counter, the tooth mirror, Mr. Thirsty, etc. You and your child will also learn the importance of preventive home care skills to help your child's teeth stay healthy and strong. 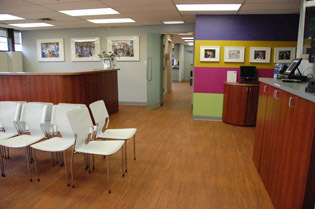 The Doctor will then gently examine your child's teeth, gums and the remainder of the mouth. X-rays will only be taken with a parent's permission. We do not take x-rays needlessly. The teeth will be cleaned and a fluoride treatment applied. Additional treatment, if required, will be discussed and scheduled for a future date. It is our goal to develop a close and direct rapport with your child in order to gain his or her trust quickly. Parents are welcome in our treatment rooms, however, in order to gain this trust we need to communicate with the child on a one to one basis. Our staff has been trained to educate our patients in a "fun and friendly" way which can make their visits happy and exciting. Words such as drill, shot, needles, etc., are not part of our vocabulary. Please do not be upset if your child cries. Children are often afraid of anything new and strange, and crying is the normal reaction to fear. A parent's positive and encouraging words following the visit, such as "You were very brave today", "Isn't it easy to have your teeth counted", etc., will help your child for their following visits. try to make the dental visit a fun experience. set a good example by brushing and flossing. let the child know that you have anxiety about the dentist. let anyone tell your child scary stories about the dental visit. bribe your child into going to the dentist, promising a special gift tends to make children suspicious. Payment is due at the time that services are rendered and can be made by cash, check, Visa, Mastercard, Debit Card, and American Express. We are Delta Dental Insurance Participants. In addition, we are happy to work with any other private dental insurance companies as an out of network benefit. For your convenience prior to visiting our office, please click below to print the New Patient Health History Form, complete the information and bring it with you to your first visit.